Located on the western edge of Iowa, Pottawattamie County is home to 93,671 residents and stands as the gateway from rural Southwest Iowa to metropolitan Omaha, Nebraska. The county encompasses 15 communities and is the largest of Iowa’s 99 counties by land area. Historically, it is the point at which the Oregon, Mormon, and Lewis and Clark trails cross – serving as a Gateway to the West. Council Bluffs, once a leading rail center, is home to nearly two-thirds of the county’s population, with remaining third of the population spread among 14 rural communities. Pottawattamie County currently ranks 91 of 99 in Iowa in terms of health outcomes. To meet this need, the county has partnered with regional trails collaborative Frontier Iowa Trails (FIT) to construct a trail system connecting communities. 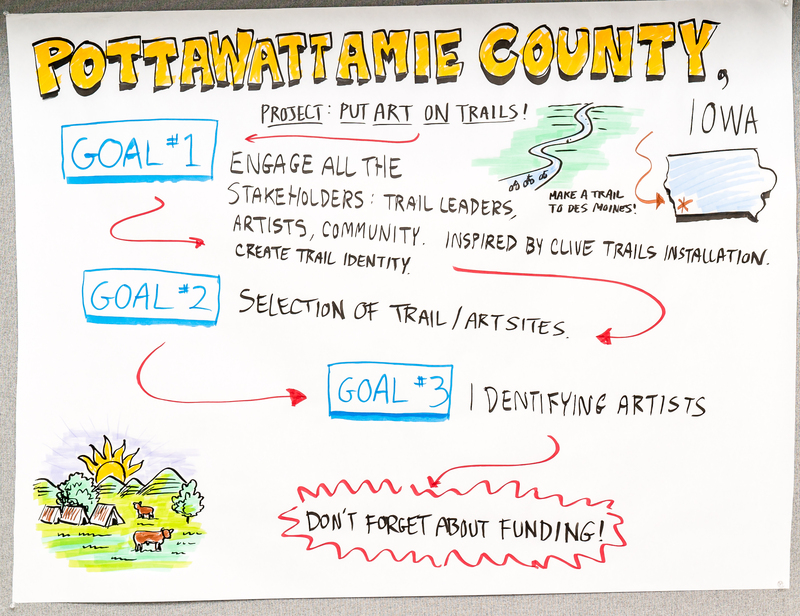 As part of this effort, the county is working to identify ways in which to integrate the work of local artists and arts interpretation into the new trail system. The trails are seen as both an attractor to new residents and an amenity for existing residents. Much of the past creative placemaking in Pottawattamie County has been organized in Council Bluffs. This effort will be focused on the county’s rural communities. Reach out to communities who have done similar public art trail projects to discuss their models. Have local community help create an identity and name for the trail and engage them in the selection of the permanent public art collection. Use technology (e.g. drones) to map the landscape and help identify and photograph potential locations for public art. Talk with stakeholders to identify spots they think would be good for public art and what type of public art they see fitting that space -- thinking beyond typical public art to benches, bridges, etc. Start an annual arts competition similar to Clive, Iowa's Art Along the Trail. Goal #3: Identifying artists and funding. Call for artists using local and state arts networks. Identify and engage a grant sourcer and writer to help identify and apply to grant opportunities.